A Covington Police dog is injured again - and now a suspect faces charges for violating the law named for the K9. 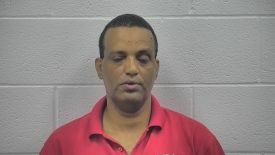 Asfaw Kassahun, 50, is in the Kenton County Detention Center where he faces charges of driving under the influence, first degree criminal mischief, failure to issue insurance card, and first degree assault on a service animal. That last charge is new in Kentucky, adopted by the General Assembly and then signed into law by Gov. Matt Bevin in 2017, which changed assaults on service animals to a felony. Previously, felony charges were only brought when such an animal was killed. 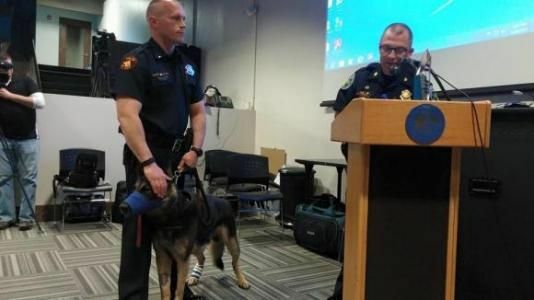 The legislation was named Ernie's Law, for the same Covington Police K9 that was allegedly injured by Kassahun, whose car collided with a police cruiser carrying the dog. It happened Friday night on I-75. Kenton County Commonwealth's Attorney Rob Sanders said that Kassahun is the first to be charged under Ernie's Law, which the prosecutor and Covington Police officer Michael Lusardi, Ernie's handler, were instrumental in getting through Frankfort. Ernie was injured after being shot twice in 2015 while police were attempting to an arrest a man who had stabbed his mother. Daleon Rice later pleaded guilty and was sentenced to 40 years in prison. "Who would ever imagine Ernie would be the first victim protected by his own law," Sanders tweeted on Saturday. Ernie was also injured in a car crash in 2016. Kassahun will be arraigned in Kenton District Court on Monday. He is being held on $10,000 bond.